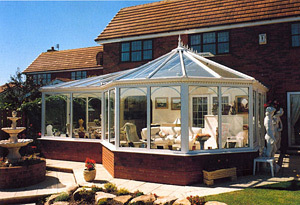 A Stunning example of how a P-Shaped Conservatory Combines Elements from 2 Conservatory Types. The standard self build P-shape conservatory kit is created by combining the Victorian and lean-to styles into one unit. The main area is the Victorian and this is connected to the lean-to roof by means of a structural 'valley'. The lean-to roof can either be finished using shaped glazed frames or by introducing a hip. As a rough guide the Victorian or 'bay' should be no bigger than 5m x 5m and the lean-to or 'spur' can be any width but will be restricted by the size of the facets on the front of the bay as the valley must join 300mm before the first facet begins. The DIY P-shape roof may look complicated but by assembling the structure first without tightening the bolts fully, you can make adjustments to make sure it is the perfect fit. The concept of the P-shape conservatory came about when home owners wanted to join the living and kitchen area and wanted more projection and style than a lean-to could offer. The P-shape can included the Edwardian or gable end styles, but these would be considered bespoke designs rather than the standard product. It is also possible to hip the roof back into a box gutter, if there are height restrictions, or you are attaching it to a bungalow. The DIY P-shape conservatory generally doubles the living space and also has a significant financial impact on the value of your home.